This rose is made with ribbon. I have got to find a way not to get myself all tangled in the ribbon or glue while wrapping this fine little bud. Its easy and fun. I to try a bigger size ribbon, though I liked this, but just to see what the outcome is. I added alittle glitter to the rose for effect, looks better IRL. Heres a close up! I used the Elegant Eggplant DSP, CS and Ink. This color is a great purple tone! 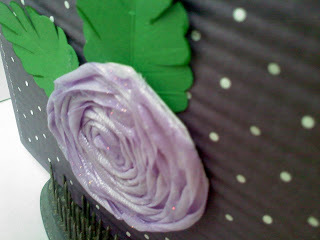 I used Lovely Lilac ribbon that I found only about 24 inches of it. So there it all is on the rose. I also popped the rose up on dimensionals, not that you can tell but its there. I snuck the petals under it. 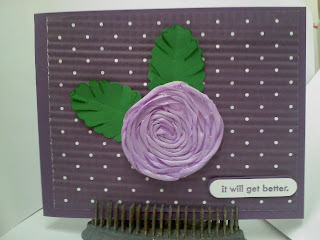 I used the scalloped oval punch scored some lines in it and then cut some of the 'leaves' out and used a marker. The It will get better is from the FYI set, and is punched out with the Window punch- also punched a eggplant out to layer behind it, which is also on dimensionals. What a fun idea!!! This is so pretty!